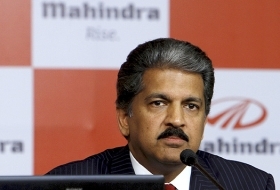 Anand Mahindra: "We want to be India's first global cult brand." SINGAPORE -- At Ssangyong Motor Co., South Korea's third-largest maker of sport utility vehicles, just about everything that could go wrong did in the past two decades. The company switched owners four times, faced bankruptcy and suffered one of the most violent strikes in modern Korean history in 2009. Workers in that clash took control of a plant for almost three months, using iron pipes and Molotov cocktails to battle air and land police commandos armed with tear gas and water cannons. In November 2010, Anand Mahindra, a scion of one of India's richest families, stepped into the mess. His flagship company, Mahindra & Mahindra Ltd., bought 70 percent of Ssangyong for $378 million. M&M is part of Mumbai-based Mahindra Group, a conglomerate with 110 subsidiaries in banking, finance, information technology, real estate and resorts. Mahindra, the company's vice chairman and managing director, says he's confident that M&M can turn the Korean automaker's run of bad fortune around. He says he'll invest in Ssangyong Motor's people and products. "I see our relationship with Ssangyong as an inflection point which is going to contribute greatly to the future success of the Mahindra Group," Mahindra says. The takeover of Ssangyong is part of Mahindra's drive to make his company a world-wide name in SUVs. After acquiring stakes in three tractor makers in the past six years, Mahindra & Mahindra surpassed Moline, Ill.-based Deere & Co. as the world's largest tractor maker by sales volume in the year ended on March 31, 2010, according to the Indian company. "We want to be India's first global cult brand," Mahindra says. The purchase reflects the growing economic might of India as its companies pursue acquisitions around the world. Indian companies made 1,056 international purchases valued at $94 billion from the beginning of 2006 to June 30, according to data compiled by Bloomberg. "Indian companies saw opportunities for international expansion and were able to get these assets at a time when some overseas companies were restructuring," says Nikhil Nath, Hong Kong-based head of mergers and acquisitions for Asia ex-Japan at Nomura Holdings Inc. "Several Indian companies, including M&M, will become truly global companies in the next decade. The Ssangyong deal shows such an aspiration." India's most acquisitive company is Mumbai-based M&M, which sells tractors in 35 countries, mostly under its Mahindra brand. Also India's largest producer of SUVs, M&M made 28 acquisitions, valued at $1.2 billion, from the beginning of 2006 to June 30. Of those, 11 were outside of India, totaling $752.2 million. And its biggest acquisition to date is Ssangyong Motor. Mahindra and his wife, Anuradha, editor and publisher of two luxury lifestyle monthly magazines, together own 0.07 percent of M&M, as of March 31, according to Bombay Stock Exchange data. She also has a 1.97 percent stake in Kotak Mahindra Bank Ltd., according to Bloomberg data. The couple's shares in the two companies were worth about $160 million as of July 27. M&M, which went public in 1956, is the flagship of Mahindra Group, whose corporate motto is "enable people to rise." The listed companies under Mahindra Group had a combined market value of about $17.6 billion as of June 30, with 119,900 employees in more than 100 countries. Mahindra, 56, is part of a new, more outward-looking breed of second- and third-generation executives among India's wealthiest families, says Nirmalya Kumar, a professor of marketing at London Business School and author of "India's Global Powerhouses." "He represents the rising Indian family business that wants to globalize, modernize, professionalize and be on the cutting edge of management practices," Kumar says. "And he is very committed." The most prominent example is Ratan Tata, chairman of Tata Group, India's largest conglomerate, with 98 companies and sales of $67.4 billion in the year ended on March 31, 2010. About 57 percent of that revenue came from overseas, according to the company's website. Tata Group was founded by Jamsetji Tata in 1868. Ratan Tata is a son of Naval Tata, who was adopted into the Tata family. Mahindra, who completed his Master of Business Administration from Harvard Business School in 1981, is the third generation of the Mahindra family to run its enterprise. His paternal grandfather, J.C. Mahindra, co-founded the company in his hometown of Ludhiana, Punjab, with his partner Ghulam Mohammed in 1945. They called it Mahindra & Mohammed. Two years later, India gained independence from Britain and split into India and Pakistan, and Mohammed moved to Pakistan. The company then changed its name to Mahindra & Mahindra -- for Anand's grandfather and great-uncle K.C. Mahindra. K.C. 's son, Keshub, now 87, has been M&M's chairman since 1963. M&M, which started life as a steel company in 1945, has been expanding globally with its compact tractors since 1994, when it entered the U.S. market by opening a unit in Tomball, Texas. M&M has tractor plants in Australia, China, India and the U.S. Driven by robust sales of tractors and SUVs in 15 countries, M&M's revenue surged sevenfold from fiscal 2002 to 361.2 billion rupees ($8 billion) in fiscal 2011, and profit jumped 46 times to 30.8 billion rupees. Pawan Goenka, president of M&M's automotive and farm equipment division, has overseen much of that sales boom. Goenka, who was born in Madhya Pradesh in central India and has a Ph.D. in mechanical engineering from Cornell University in Ithaca, New York, worked at General Motors Co. in Detroit for 14 years. 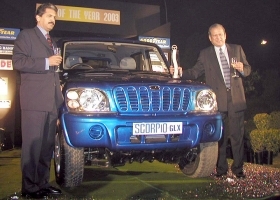 Anand Mahindra, left, with the Scorpio SUV. After joining M&M in Mumbai in 1993, Goenka led the company's landmark project to develop an indigenous SUV, the Scorpio, which has been a windfall for the firm. Goenka, nonexecutive chairman of Ssangyong's board, still lives in India and frequently travels to Korea for meetings. In keeping with M&M's ethos of nurturing leaders and preserving the culture and management of acquired companies, Goenka has delegated the responsibility of day-to-day management to Korean executives. One of his goals is to finally put to rest the past struggles of the Korean company. Ssangyong's tortuous corporate story starts in 1997, the beginning of Korea's corporate debt crisis, which would eventually cause tens of thousands of companies to go out of business and the economy to shrink by 5.7 percent in 1998. Ssangyong Group, Korea's sixth-largest conglomerate at the time, agreed to sell its debt-ridden car unit to Daewoo Group in December 1997. Two years later, Daewoo, Korea's No. 3 industrial group, collapsed under 80 trillion won ($75.5 billion) in debt. Control fell to creditor banks, which put the company under a restructuring plan. In 2004, China's SAIC Motor Corp. bought 48.9 percent of Ssangyong Motor from creditors for 590.9 billion won. That marriage ended in acrimony five years later, when SAIC decided to give up on the money-losing carmaker and Ssangyong Motor filed for court receivership. Once the company was put under bankruptcy protection, workers staged a walkout in mid-2009 when the company said it would cut one-third of its workforce, or 2,646 jobs. The employees seized the plant and fought riot police for 77 days. Some protested from the top of the 70-meter-high (230-foot-high) factory chimney. In the past two years, 15 former workers and their immediate family members have either committed suicide or died of heart attacks since the strike, police say. A year after the strike ended, M&M bought the company. The new owner chose Lee Yoo Il, who has three decades of experience at Hyundai Motor Co., as chief executive officer. Lee had been appointed by a Seoul court to manage Ssangyong after its previous owner, Shanghai-based SAIC, decided to drop it. What distinguishes M&M from Ssangyong's previous owners, Lee says, is its global mindset and efforts to communicate with all employees, especially union members. Lee says he had initial doubts about M&M taking over ailing Ssangyong. After he met Mahindra, though, Lee changed his views. "Even my wife got a crush on him," he jokes. One day after M&M signed the contract to acquire the SUV maker in November 2010, M&M gathered 3,500 Ssangyong workers in an auditorium. There, Goenka explained, through a translator, his plan to revitalize Ssangyong. Mahindra also delivered a speech in a video message. M&M gave everyone an eight-page handout on the Indian company. "We've had a number of owners over the years, but it was the first time anyone organized such an event," says Kim Kyu Han, Ssangyong's union leader. "Never before did we have such an attentive audience." Apprehensions about yet another foreign owner, one that the workers had never heard of, have gradually eased, Ssangyong's union leader Kim says. "It's early days, but there is already a sense of trust among M&M, management and union," he says. Mahindra agrees. He says M&M brings financial stability and investment to Ssangyong. It also adds engineering for alternative fuels and electric vehicles, he says. Ssangyong has technology and 1,071 dealers in 91 countries. "Each partner is vital to the other partner's aspirations and goals," Mahindra says. "That is why I'm confident that together we will be able to carve out a successful future." Not everyone is as confident. Ssangyong's management faces the daunting challenge of developing a new line of models and upgrading aging factories and equipment, says Lee Hang Koo, director of the automotive industry at the Korea Institute for Industrial Economies & Trade, a state-run think tank in Seoul. 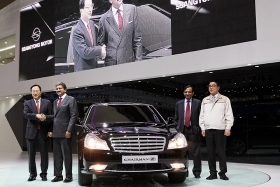 Ssangyong Motor CEO Lee Yoo Il, left, and Anand Mahindra, second from left, introduce the new Ssangyong Chairman H sedan at the Seoul Motor Show in March. Ssangyong managed to post only a small profit in two of the past six years and reported a loss in the first two quarters of 2011. "This is a company that endured the past five years with hardly any investment," Lee says. He estimates that Ssangyong needs two or three additional SUV models to compete in Korea after introducing the Korando C this year, its first new model in almost three years. "There is a lot of ground to make up." Mahindra, known for his signature black mustache, impeccable Western suits with a tie and matching pocket handkerchief and the eloquence of his speeches, remains upbeat. He plans to build Ssangyong back to profitability by investing in research and production. He's a visionary, Goenka says. "He looks at the bigger picture and doesn't get bogged down by numbers," Goenka says. "In fact, he hates numbers. He will want to smell the business, and he gets very enthusiastic about styling and branding." Mahindra has adopted M&A as a key strategy to scale up his company, making it globally competitive. Mahindra Group has a team of 12 acquisition specialists to work with different divisions of the group. Goenka says a successful acquisition depends on M&M's knowledge of the company it wants to acquire as well as managing cultural complications after getting the deal done. "For us, it is very important to win the hearts and minds of the people who are working for the company," Goenka says. "This philosophy of Mahindra has worked well with Ssangyong." Mahindra has embraced Twitter to promote his conglomerate and communicate his views. He had 332,883 followers as of July 27. He recently tweeted with a photo of a street scene during his trip to Istanbul: "Istanbul has buildings as old and dilapidated as Mumbai's. Trick is to have clean, paved roads & voila, you have a world city." In Mumbai, where he was born and raised, he's riding the country's economic boom and expanding his family's empire internationally. And in Ssangyong Motor -- his biggest bet so far -- investors are watching to see whether he can rebuild the automaker, something none of its previous Korean and Chinese owners could do.